Sober Look: US equities and the "Rule of 20"
US equities and the "Rule of 20"
Numerous analysts - often the same ones that were bearish just six months ago - continue to talk up US equities using a variety of metrics. These include comparisons of dividend yields or PE ratios to treasuries, etc. One of the more unusual metrics is the so-called Rule of 20. Developed over 30 years ago by Jim Moltz, the rule states that for equities to be "fairly" valued , the average PE ratio plus the inflation rate has to be around 20. With the current PE ratios, the Rule of 20 metric now clocks at around 17 (PE=15, Inflation =2). That means to be valued "fairly" on a historical basis, US stocks' PE ratio should be around 18, allowing quite a bit of room for multiple expansion. That's assuming of course that inflation stays subdued. Also Mr. Moltz likely didn't contemplate deflation risk when designing this rule. Historically the Rule of 20 performed well in 2000 by pointing how overvalued the market was prior to the correction, and then again in 2007. According to ISI, the current situation is more akin to 1983, when we were still living in the shadow of the "Death of Equities" and the Rule of 20 metric was at the lows. 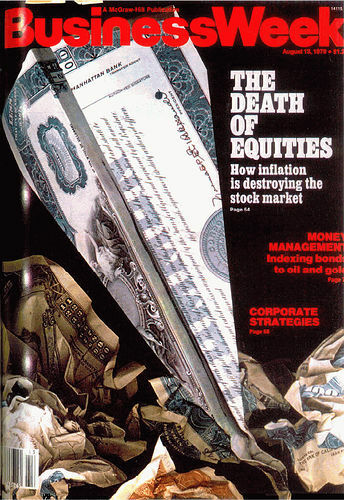 This "death" was proclaimed in 1979 on the cover of Business Week, which read "How inflation is destroying the stock market". Of course by 1983, after Volcker had raised the Fed Funds rate to 20% in 1981 (hard to believe, right? ), inflation rate had receded. The "anti-equities" mentality however still persisted, creating an opportunity. Since then, the S&P500 increased more than 10-fold (particularly if dividends are taken into account). The Rule of 20 therefore paints an incredibly bullish picture for the US stock market over the next couple of decades. 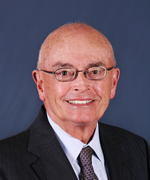 Will Mr. Moltz be proven right again?